ON THE STREET : Kylie Mendonca availed herself of a bike, car, scooter, bus, and old-fashioned thumb to discover the best way for students to get from here to there in San Luis Obispo County. # You education seekers are a boon to the local economy while being a plague on SLO's single-lane highways and one-way streets but you don't have to get stuck with that identity. Last week, while my boss paced back and forth in the newsroom, cursing my empty desk with each pass, I was doing research. I set aside my much-loved bike and took up some alternative transportation even (gasp) an automobile to test some personal theories about what's fast, what's convenient, and what works to get around in San Luis Obispo. In this experiment, the city of SLO acted as a hub for trips to Cal Poly, Cuesta, and Avila. Admittedly, the methodology was fuzzy: I took a bike, a Civic, the bus, and an electric eGo scooter. I also hitchhiked twice. I judged each mode of transit based on speed, parking ease, general convenience, and environmental friendliness. My theory was that you don't need a car to get most places in the county, and often the time saved trying to park an automobile will outweigh the convenience of driving one in the first place. Except for Cal Poly, downtown has the worst parking problem in the city. But don't blame the city planners: It's just a small area with a lot of draw. Driving and parking there will take you longer than getting there, so don't do it that way. The parking structures fill up, off-street spots are unreliable, and SLO's meter maids are many. It's basically set up for biking. TWO WHEELS BETTER : If you've ever dreamed about riding on streets devoid of cars, try the new Bike Boulevard on Morro Street. 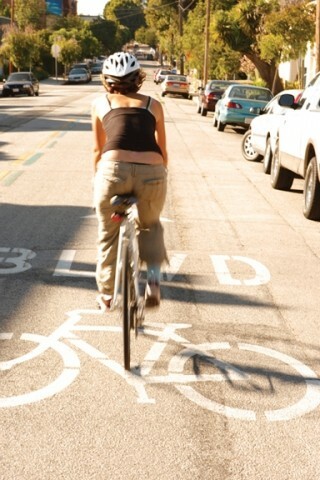 # Marsh Street boasts a bike lane and Higuera is wide enough for bikes. Watch for car doors. Also, check out the new "bike boulevard" on Morro Street. Linnaea's on Garden Street offers bike parking, as does almost every corner. And the Bike Coalition a local bike advocacy group provides free bike valet service at Farmers' Market on Thursday nights, Concerts in the Plaza, and just about every downtown event. The eGo scooter (thanks to Scott at SLO eGo for the loaner) may need a little introduction. It's an electric scooter that tools along at about 25 mph. The eGo's best qualities are that it's cheap (around $1,500), it costs about six cents to charge, and it's pretty clean no direct emissions. But it can only go for 20 miles before it needs to be charged again (from any outlet). Alas, it's not made for off-roading. Or dates. Still, the eGo works great in a downtown setting. It's basically a bike that you don't have to pedal. Drive it in the bike lane, lock it to the bike rack, race cars, then take it home and plug it in. You look kind of silly, but it's fun. Dear Cal Poly freshmen: Your $285 parking pass doesn't ensure that you will always find on-campus parking near your dorm. Or at all. If you live within two miles of Poly, getting to campus won't be any faster on a bike, a scooter, or a car but finding parking will take longer than all of them. Remember: Poly students can ride the bus for free. It takes roughly the same time as a car (that operates on a schedule and makes several stops), but you don't have to park or pay for gas. Cuesta is about seven miles from SLO, so this might be a shocker: It's not faster to drive there from town, once you factor in parking. From downtown SLO, a Cuesta trip will take 10 to 15 minutes of driving, followed by another 10 to 15 minutes spent parking and walking to campus. If you take Highway 1 on a bike, the ride is about 25 minutes, and you can go directly to class. The scooter can make it in about 20 minutes, but you have to find an outlet before you can go home. Taking the bus is the best way to meet interesting people, and the journey lasts about 15 minutes. If you pick up hitchhikers, keep in mind that the California Men's Colony and SLO County Sheriff's Department are close by. I've picked up kids walking home from the drunk tank and have scammed rides home from Cuesta myself but once I picked up a nice young man who told me that he'd just served three years. I don't know what for. Just be careful. There are many reasons to go to Avila, such as fresh fish tacos on the pier, sun, surf, and sand. Just watch for sharks. It's fastest to drive there 10 minutes on the freeway some temporary delays will add five but the parking situation is bleak. My recommendation? The Bob Jones Bike Trail one of the friendliest in the county will take you right to the beach. Be prepared to pedal. And wherever you're going, remember: If you're going to be in SLO for the next couple of years, don't just be a tourist. Meet your neighbors and get comfortable with your 'hood. The best way to do it is to get out of your car. Walk, ride, or scoot. Kylie Mendonca likes to feel the wind in her hair and the road rash on her skin. Send your travel tips to kmendonca@newtimesslo.com.